Audun Halvorsen, born 1979, grew up in Haugesund on the west coast of Norway. He started his studies with Robert Rønnes and continued in the Norwegian State Academy of Music with Eirik Birkeland and Knut Sønstevold. Ole Kristian Dahl has been his teacher and mentor since 2001. 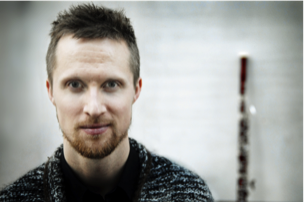 Audun got his first job as Principal Bassoonist in the Norrköping Symphony Orchestra in 2001. During 2002 he also held the same position at the Norwegian Opera, Oslo, followed by Rotterdam Philharmonic Orchestra 2005-06, and NDR Sinfonieorchester Hamburg in 2010-11. He is since 2006 Principal Bassoon in the Danish National Symphony Orchestra DR in Copenhagen. As guest principal he has also appeared with orchestras such as London Symphony Orchestra, Mahler Chamber Orchestra, Oslo Philharmonic Orchestra, Swedish Radio Symphony Orchestra, Gothenburg Symphony Orchestra and Bergen Philharmonic Orchestra. He was a member of the Luzerne Festival Orchestra 2011, with Claudio Abbado as Conductor. He did his solo debut in 2003 with Stavanger Symphony Orchestra as ”The Young Musician of the Year”, followed by solo appearances with Norrköping Symphony Orchestra, Norwegian Radio Symphony Orchestra and the Danish National Symphony Orchestra DR in Copenhagen. In 2003 he won the ”Crusell Bassoon Competition” in Uusikaupunki in Finland, and was also given the ”Norwegian Shell prize”. Audun is an active chamber musician, is a member of «Diamant Ensemblet» in Copenhagen, and has participated in chamber music festivals, such as the festivals in Risør, Stavanger, Oslo, Gloppen, Korsholm, Uusikaupunki and Isafjordur in Norway, Finland and Iceland. A warm complete sound that is easy to change in timbre, but still sustain the same sound from pppp - ffff without forcing it. Equal resistance through the whole register and same intonation in any octave. A lot of air-resistance but low lip-pressure." This new high tensioned Halvorsen-shape combines the best with a medium-hard or even hard cane. I totally trust on Hans expertise to select the cane from the various plantations for the best results on my model. With canes from the most French plantations, like Marion, Rigotti and Silvacane, and the Spanish Medir plantation for example, we gain the desired results."